Join us on Wednesday, May 8, 2019 at 7pm-9pm in the Wisconsin Room, UWM Union for a celebration of achievement, identity & community! We welcome May and December graduates to walk at our annual Lavender Graduation 2019 ceremony! In 1995, the first Lavender Graduation ceremony was coordinated at the University of Michigan by the LGBT Campus Resource Center Director Ronni Sanlo. Dr. Sanlo realized that LGBT students needed to be recognized for “not only their achievements but for surviving their college years” (Sanlo, 2000). The graduation began as an effort for students to feel connected to their institution and celebrate their identity, which are similar reasons for ethnic groups hosting their own graduation ceremonies. Dr. Sanlo served as the Director of the University of California, Los Angeles (UCLA) LGBT Resource Center. When Dr. Sanlo became the director at UCLA, she immediately coordinated their first Lavender Graduation in spring 1998. Fifty-nine of The Advocate Top 100 LGBT Friendly Colleges and Universities sponsor a Lavender ceremony (Windmeyer, 2006). The University of Wisconsin – Milwaukee LGBT Resource Center coordinated the campus’ first Lavender Graduation in 2010. At this ceremony, 16 graduates were honored and the ceremony has been an annual event at UWM since this 2010 milestone. For some students, the University of Wisconsin – Milwaukee was the first place they explored and grew in their LGBT+ identities. For some students, UWM was the place their personal passions met their academic pursuits. No matter what the case – Lavender Graduation is designed to celebrate achievement and identity. We welcome all UWM graduates to participate. Lavender Graduation, at its foundation, celebrates the achievements of the graduate through the lens of their identity across the spectrum of gender identity, gender expression and/or sexual orientation. The University of Wisconsin – Milwaukee Lavender Graduation ceremony has been made possible through a generous donation from Joseph R. Pabst. Register to walk in the ceremony or attend as a guest below. (First & Last) We need this to verify your graduation status. This information will remain confidential and will not be included in the program if an alternative name is provided. Please fill this in phonetically. (e.g. Pounce Panther would be read as "Poun-s Pan-thur") This will help us avoid any mistakes when calling your name. December 2018, May 2019, etc. e.g. BA, BS, MA, MS, PhD, etc. What will you miss most about UWM? These will potentially be shared in our Lavender Graduation program as well as on our twitter page, anonymously. Advice to incoming first-year students? These will potentially be shared in our Lavender Graduation program as well as on our twitter page. Let us know if you plan on attending as a guest! Know an outstanding UWM staff or student? Nominate them for a Lavender Graduation Award by filling out our Nomination Form. Nominations close on Sunday, April 28, 2019. Award Criteria: Proof of organization participation, accomplishments, must be able to be provided by upon request. All persons nominated must be UWM students, faculty, or staff. A campus community member is ineligible to receive an award in 2 consecutive years. The 2019 ceremony will be hold on May 8th from 7:00pm-9:00pm. This does not have to be the nominee's legal name, any name in use is gladly accepted. Please fill this in phonetically. This will help us avoid any mistakes. EX: Pounce Panther would be read as "Poun-s Pan-thur"
The 2019 ceremony will be held on May 8th from 7:00pm-9:00pm. Proof of organization participation, accomplishments, must be able to be provided upon request. All persons nominated much be UWM students, faculty or staff. A campus community member is ineligible to receive and award in two (2) consecutive years. What award are you suggesting a nominee for? Eldon Murray Legacy Award: A true pioneer in the national gay rights movement, Eldon Murray helped start the Gay People's Union, the Milwaukee AIDS Project which became the AIDS Resource Center of Wisconsin, and Senior Action for a Gay Environment (SAGE) Milwaukee. Presented to a graduate who has taken initiative toward a vision of creating positive change, promoting awareness, and building community for/of LGBTQIA+ at UW-Milwaukee. Interactive Student Award: As a member of an oppressed community it is important to educate and network with others to create awareness and strong relationships to help decrease and diminish the oppression. Presented to a student who has demonstrated tremendous effort to serve the LGBTQIA+ community through building coalitions with members of diverse communities to end all forms of oppression. Cheryl Kader Distinguished Service Award: Presented to a member of the campus community who makes significant, sustained contributions to campus and broader LGBTQIA+ communities; work done on communities and professional positions may be considered for this award. All students are eligible, deference is given to graduates. LGBT+ Research Award: Recognizes an outstanding published or unpublished paper written or research conducted while in residence at UWM, research which promotes understanding of topics relevant to LGBTQIA+ communities. Students nominated for this award will be asked to provide an abstract or brief synopsis of their paper/research/findings. Dr. Jeff Merrick Leadership Award: Faculty and Staff play a role in educating, rearing, and role-modeling for students at UWM. Presented to a member of the faculty who has shown dedication and support for LGBTQIA+ people through taking initiative in order to stand up and speak out against issues of homophobia, transphobia, heterosexism, and cissexism. Please indicate why the nominee merits receipt of the award you indicated above. The Lavender Graduation Committee will notify each nominee of their nomination. 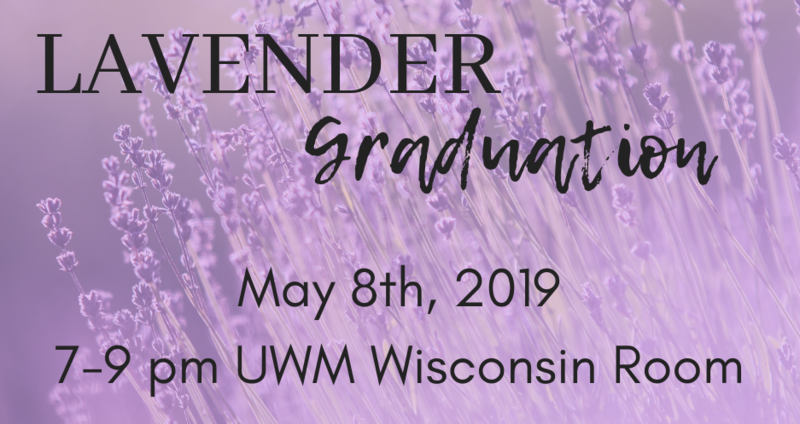 The UWM LGBT Alumni Chapter has been co-sponsoring Lavender Graduation since 2010. The LGBT Alumni Chapter is UWM’s official alumni organization for LGBT+ and allied Panthers and has been a part of the UWM community since 2010. Get involved with the Alumni Chapter here.